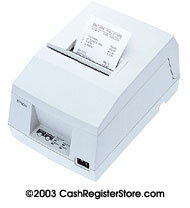 This cost-effective printer is designed to meet the high reliability, small footprint needs of the banking industry. The TM-U325, a one-station, 9-pin dot matrix printer, features a fast print speed of 3.5 lines per second (lps) for 40 columns of print and 6.4 lps for 16 columns of print. The TM-U325 permits bi-directional printing, prints up to 12 lines of validation and has a flexible paper inch setting allowing the customer to print in user-defined formats. This bi-directional printer features multiple-line validation and selectable fonts for added printing versatility. Epson's world renowned quality and reliablity are reflected in every component and mechanism of the TM-U325, ensuring products unsurpassed in performance and dependability.